I must say, this year's merdeka celebration is surely one of the biggest and to be remembered for quite some time. it's the big five-o. I woke up very early in the morning to watch it...on TV. hehe..I don't think it's appropriate to drive to Melaka town just to watch the event when the biggest would surely be in KL. So, better watch it on TV. I used to be in merdeka parade once. But for Melaka state level only..I couldn't forget all the sweat and tiredness I'd gone thru for the practises. My face went black after the parade due to long hour exposure to the sun (I was fairer before the event). But all that paid off when we marched before our TYT and Ketua Menteri. Nothing in this world could beat that feeling. Honoured and proud. Other than that, I went to my granny's kampung for the sole purpose of...visiting her. It's been so long when I last see her. But before pushing off to granny's house, my mom told me about a wedding to take place at my sedara's house, very near to my granny's house..aiyoo..the event I have been trying sooo hard to avoid..But i just can't cancel my trip just not to attend the wedding. So, I went. It was quite an eventful wedding. Meriah sakan gak la, even tho it's at the groom's house (my cousin is the bridegroom). They even had "ayam golek" as one of the main dishes. Not bad! 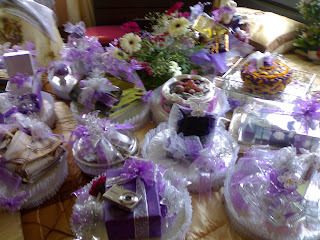 Wish I could have the same menu for my wedding...These are the "hantaran" from the bride to the groom. 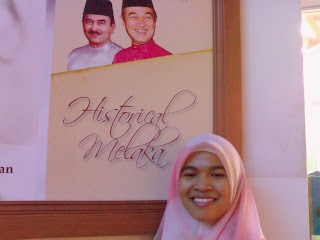 I also decided long ago that I wanted to add little accessory to my house in Melaka. 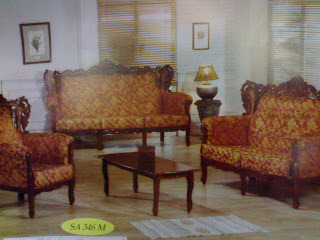 A set of couch! So, when I was in town, I did check out few couches to complement my house and my heart really set out for this couch..I think it's modern and just "my taste". 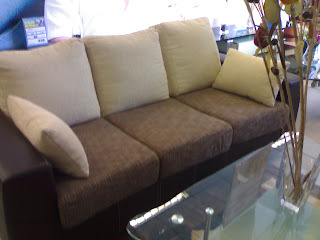 best nyer...cuma kuno la sofa yg mak ko pilih. agak heran yer zaman2 skrg nie...ekekekek. tapi yer la kadang2 je leh buat dia hepi kan.
bigg...i'm still looking for one. but recently, i heard someone from PCSB can verify. 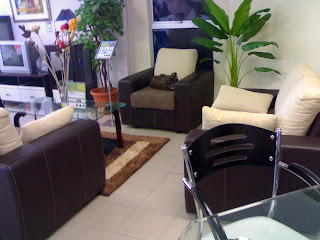 you can call my office number 09-8266455 (ask the operator for my name, lina). I'll tell you who it is.